Old Harbor Life-Saving Station Museum, by David W. Dunlap (2009). 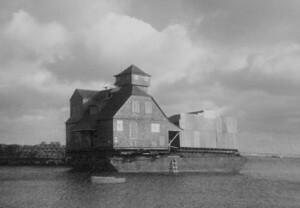 Old Harbor station being transported to Provincetown, by Josephine Del Deo (1977), courtesy of the Provinceton Public Library. The Old Harbor Life-Saving Station was built in Chatham in 1897, based on the Duluth-style prototype of 1893 by George Tolman. It was decommissioned in 1944. The Park Service bought it in 1973 and moved the building down cape, by barge, in 1977. (Paradoxically, the Duluth-style Wood End station was razed in the 1960s.) In Seashore Sentinel, Richard Ryder told of an old salt who said, as he watched the spectacle, “I’ve cruised by a lot of Coast Guard stations during my lifetime, but this is the first time I’ve ever seen a Coast Guard station cruise by me.” An extensive renovation began in 2008. Old Harbor is now a museum where the staff demonstrates the breeches buoy, a gun-launched lifeline used to pluck sailors off foundering vessels when it was too rough even for the surfboats.